* Help celebrate her transition from childhood to womanhood by commemorating that special girl's Quinceanera with a unique personalized gift. 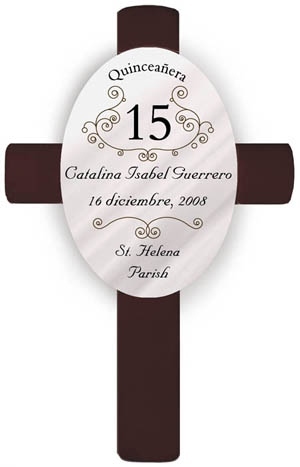 * This cross is fashioned in rich wood tones, adorned with an attractive wood composite oval with filigree design, bearing the name of the honored guest, the date of the event, and her home parish. * Cross can be printed in English or Spanish (please enter personalization information in preferred language). 11" x 7" x 0.75"